Once again we are very pleased to have been invited to be a part of the Artists Book Weekend organised by The Mews Project Space; where we will be producing Volume 2 of What is an Art Book? For this second volume we will once again pose the simple but important question What is an art book? An Art Book today can be seen to occupy various different positions including that of a piece of theory, a catalogue, a printed exhibition, a piece of art in itself, a supplement to a pre-existing piece. It can be a proposal for the future or an examination of the present or what has passed. 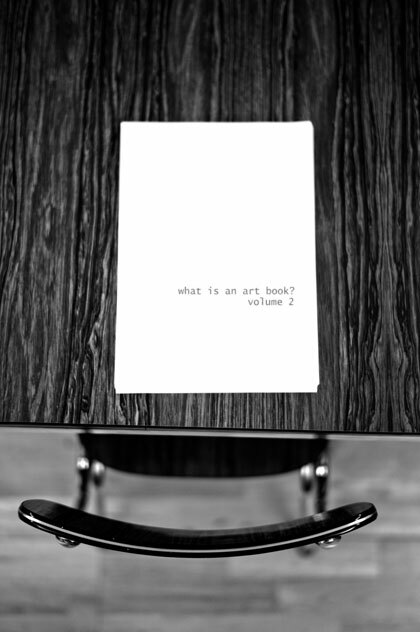 “What is an Art Book?” will be an investigation of what an Art Book is in terms of material and conceptual concerns. It is a collaborative project that will be produced during the Artist Books Weekend at the Mews Project Space. Artists, writers, curators, designers and other practitioners are invited to respond to the title of the project by contributing their interpretation of what an Art book means to them and their practice. Each contributor can propose text, drawings, photographs, sculpture, performance, audio recordings, video or any other concept/theory as long as it can ultimately be realised in A4 paper format and in black and white. The Artist Books Weekend is an initiative of The Mews Project Space. Please check the ABW website for the many events taking place over the weekend at The Mews Project space and affiliated organisations. The Artists’ Book Weekend is an open affiliation celebration of Artist Books as a medium. Happening in parallel to the London Art Book Fair, it aims to complement the Whitechapel Gallery event by highlighting the medium of the Artist Book and other methods of multiple production, as well as encouraging people and spaces to put on events throughout the four day ‘weekend’. The Artists’ Books Weekend (ABW) is open for anyone to participate. It is an umbrella name to an Open source style festival set every year according to the dates of the London Art Book Fair. This is a project started by The Mews and run by all participating organisations.